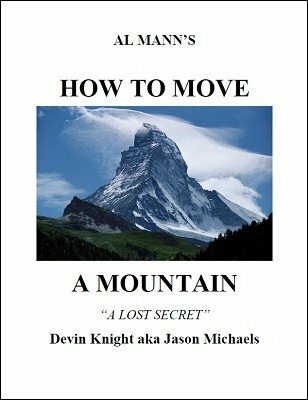 Is it possible to move a mountain, lake, shoreline or even an island? Al Mann and Devin Knight say, “Yes.” In 1995, Al Mann wrote a rare treatise on how to do just these things. The few magicians, who read this, glossed over it, saying the ideas were impractical and pipedreams. The ideas may have been impractical for most magicians, but they were not pipedreams. Al Mann and Devin Knight explain in detail how you can do these feats, if you have the money and resources. They explain in detail how you can get headlines in the newspapers by moving a local peninsula a mile or two away that can be surveyed, proving it was actually moved! No, you don’t move it back either! Al Mann explains how a mentalist or psychic can increase land. What? Yes a parcel of land that is four acres may mysteriously turn into one that is seven acres. The secret is in the book. Al Mann also explains a way that a psychic could apparently make an island disappear. Are these feats workable? Yes. Are they practical for most magicians? No. Is this the ultimate gospel trick? The magi-minister says that if you have the faith the size of a mustard seed, then you can move a mountain. Using the secret in this eBook, the performer does just that. 1st edition 1995; 1st digital edition 2016, 11 pages. Understanding how this effect is accomplished will add to your cleverness as a magician. This is clearly written and is a good read.